When you have a pool on your property, it’s nice to be able to use it just as much in the evening and at night as during the daytime hours. Even if no one plans to swim at night, you might want to extend gatherings to a poolside deck space. To make use of this type of space at nighttime, you need an outdoor lighting solution. In the San Antonio and Austin areas, Enhanced Outdoor Lighting & Design offers quality poolside lighting solutions. We know that outdoor poolside lighting is especially important in this part of the country where you could potentially use the pool and enjoy the outdoor poolside space year-round. Rather than relying on unprofessional lighting that reduces the beauty of the poolside space or transportable options that you have to carry and store, consider professional poolside lighting solutions that will handle outdoor conditions and provide lasting use. This type of lighting will enhance the visual appeal of your pool area and thus your entire property while helping you enjoy this outdoor space into the nighttime hours. In many cases, the deck around the pool is the area you plan to use most at night. It can be extremely enjoyable to sit near the pool while surrounded by the peacefulness and beauty of the outdoors or while entertaining guests. Plus, you may have great seating and entertainment areas around the pool deck that you want to use for evening parties. You may even have a barbecue near the pool for making dinner or party meals. Permanent lighting fixtures help you enjoy your pool deck no matter what time it is. When the sun goes down, your family can continue to use the pool, or you can easily host your get-together. This option could also be helpful for a business with a useful pool deck area. Through better lighting, your pool deck can also become safer. You can prevent children and guests from slipping on the poolside or accidentally falling into the water from reduced visibility. And a brighter deck can help illuminate the pool to know whether it’s clean and to keep an eye on swimmers. Our lighting solutions can expertly light up your entire exterior pool area. This can include your pool deck and gardens, trees, or lawn space that surround the space. We can surround your outdoor pool with light to give you a space you can enjoy at all hours. In some cases, exterior pool lighting incorporates lighting on your home’s exterior or other areas that extend beyond the pool itself. In exterior pool spaces, we believe that LED lights are the perfect fit. This type of lighting does not give off much heat, saves on energy and lighting costs, and provides strength and durability for outdoor conditions. Exterior LED lights can handle the wet conditions of a pool area and provide reliable light for your different activities. At Enhanced Outdoor Lighting & Design, we carefully consider the lighting design for your pool area. We will take your preferences, uses for the area, and the features of the space into account when we create a customized design. Our design can include lights within the pool, on the pool deck, and incorporated into other poolside areas. Our design team creatively brings out the best features of your in-ground or above-ground pool area with our professional design experience. We can create different aesthetics, whether you prefer full lighting for maximum visibility or mood lighting with subtle lights spaced out around the pool area. We are professionals who can create the best look and function for any pool style. We can enhance the simplest pools while bringing out the beauty and style of detailed pool designs. We can highlight various pool features, such as the columns or structures of a Mediterranean pool or the trees and waterfalls of a tropical pool. Our lighting options can add excitement and better visibility to traditional, modern and infinity pools as well. Our team at Enhanced Outdoor Lighting & Design provides design expertise to create a well-planned aesthetic. 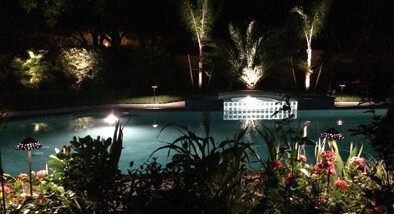 At the same time, we are lighting experts who are experienced in installing different types of lights in a pool area. We can even replace your current lights if they are no longer working or you would like to upgrade to efficient LED options. If you’re not sure how we could boost the appearance and function of the poolside area at your Austin or San Antonio area home or business, look through our portfolio for some ideas. Plus, we are happy to provide a free consultation and estimate so you know our design plan and the cost before moving forward. Please contact us today to set up your consultation appointment.